Oaxaca City has some of the most popular markets in the country. While buying and selling is the principal activity at the markets, it also provides an opportunity for people to socialize. Locals gossip when they meet at the markets and visitors get a chance to get a peak of the “real” Mexico. Responsible travelers should take note that money spent in these markets circulates quickly and supports the local economy. In a traditional market, visitors can buy food and crafts. Meals are often available as are fresh juices. Durable market bags, made of synthetics and often embossed with a design or the merchant's name make excellent souvenirs —- like buying postcards at the post office! Bring small bills and change when you buy anything. Don't expect to get change for a small purchase if you are paying with a 200 or 500 peso note. Be time specific. If you are seeking produce for today or tomorrow, be specific. Venders are pleased (and at times insistent) in choosing the right produce. Don't block the corridors. Remember that the market is a work environment. If you're in a group or traveling by yourself, keep the corridors clear for other clients. Always ask before taking pictures. It's common courtesy, particularly for close-up shots. Better than taking a photo is printing out a photo from our Oaxaca Markets Collection. Find the vender and give them the copy. Be generous! Pay attention. Tourists in markets are “easy targets” for thieves. Lessen the chances of robbery by paying attention. 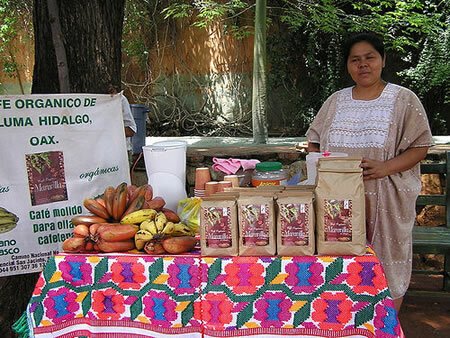 The newly developing Oaxaca Market Project is an initiative of Planeta and friends in Oaxaca. We ask visitors to print photos (seen here archived on Flickr and give them to the venders. This puts a new spin on the traditional "take only photographs" mantra by giving the photos back and raising awareness and increasing purchases of traditional crafts and local food. What might be a rushed visit becomes a search for familiar faces and seasonal products. This guide encourages you to learn about the markets before a visit. Enjoy! Ron Mader is a long-time Transitions Abroad Latin America correspondent, Responsible Travel columnist and host of the award-winning Planeta website.